August 07, 2017, 3:30 p.m. This poll shows that the current tensions between Qatar and its neighbors are gaining some significant attention in the US. The crisis over Qatar has created deep diplomatic tensions in the Arab world, and they are now playing out onto an international stage. 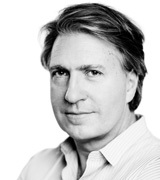 The US is, of course, a hugely significant influence on the region so it is valuable to understand how the disputes have been understood by the American public. As part of our partnership with Arab News to research and analyse an international perspective on the Arab world, YouGov surveyed a representative sample of over 2,000 Americans between July 19-21, 2017. Egypt was considered an ally or friend of the US by 47 percent of respondents, compared with 39 percent for the UAE and 37 percent for Saudi Arabia, ahead of Qatar at 27 percent, Iraq at 19 percent, and Syria at 8 percent. Qatar was the least known of the six, with 43 percent unable to express a judgment on the country. Of those that do claim knowledge of Qatar, the picture they paint is somewhat negative. We asked them what attributes they most closely associate with the country and the most common association was “being accused of financing terror groups,” chosen by a third. Even with the high publicity surrounding the FIFA World Cup 2022 soccer tournament, only 16 percent associated Qatar with being the host of the championship. The poll found that 71 percent of Americans claim some degree of awareness of the dispute between Qatar and the Gulf Cooperation Council (GCC) nations. 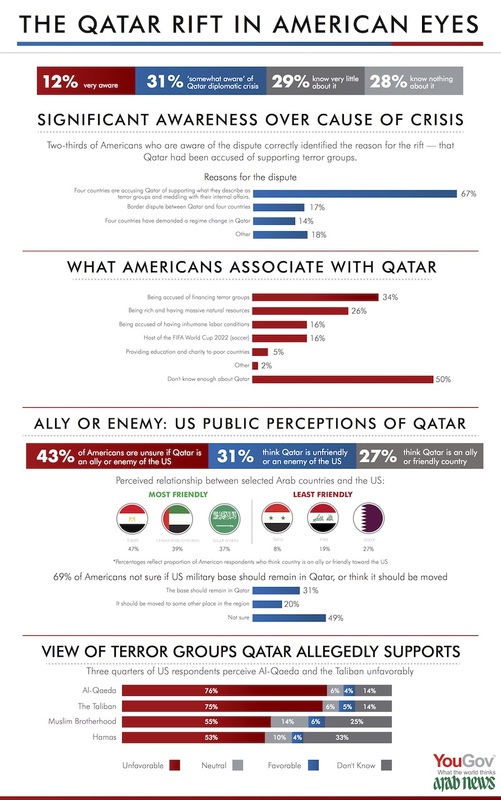 Among those, 67 percent identify the root cause being accusations of Qatar supporting terror groups and meddling with the internal affairs of other GCC countries. Americans are divided over the issue of how their country should react to the situation: 49 percent of aware respondents are unsure if their military air base should remain in Qatar, while 31 percent agree it should remain, and 20 percent think it should be moved. In contrast to the low familiarity with Qatar, the country’s Al Jazeera media network has achieved high awareness. The broadcaster is known by 63 percent of Americans, but their impressions are negative: by around two-to-one they associate it with giving a platform to terrorist groups and having a negative influence on the image of the Arab world. In spite of America’s liberal laws on publication, by 55 percent to 19 percent Americans favour censorship of TV content that promotes terrorist causes or incites hatred. The American public is not usually characterized by its strong interest in foreign affairs, rather the opposite. However, this latest poll shows the current tensions between Qatar and its neighbors are gaining some significant attention.